Andrew got the early morning fire crackling by our rocky Georgian Bay shoreline at our place at Neyaashiinigmiing on Thursday. The sun decided to show itself, bringing with it a few wisps of clouds, mild temperatures and a light breeze – overall, it looked like a beautiful day for the Bagida’waad Alliance’s community lunch. The evening before, we had collected up Chefs from across Ontario to stay over in our trailers and home, to be ready for the early start preparing the free meal for the Nawash Community Members as part of our community’s soup kitchen. As a traditional fisher, my husband Andrew was one of the few fishers left who went out in a punt and laid the nets by hand, and we had one of the only Indigenous run-and-owned fish processing plants in Ontario. At the end of last year, we started a new environmental group, the Bagida’waad Alliance, which means ‘they set a net’ in Anishinaabemowin, because we wanted to start being more proactive about the lake and waters. We could see that the catch was down, the wind was up, the temperatures were up, and the fish weren’t healthy. The Chefs had been hearing about the changes we’ve noticed for years, and once we stopped going to Toronto for the St. Lawrence Market this summer, we were missed by the Chefs and our many clients. Our family had to stop fishing, because of the effects of climate change and changes in the fish and waters around us. The Chefs wanted to support our new venture, which centres around doing research about the waters, documenting stories about fishing, and doing stewardship activities with the youth, and Miriam Streiman jumped on board to start organizing an event with me. Back to that beautiful morning, Andrew showed the Chefs around the farm, talked about the permaculture techniques he’d created, and people got to visit with the goats, horses, chickens, pigs and ducks. We had an early start to the day with Candice Newmaster’s Ironwood coffee and an intriguing and delicious Spanish Omelette made by Luis Valenzuela for breakfast with eggs from our chickens. We headed over, and some more Chefs also began showing up at the community centre around 8am – it was a well-orchestrated kitchen prep considering the number of people. Our extra volunteers started arriving, and two of the Bagida’waad Alliance’s board members came out to help – Meghan Lipka and John Anderson. I did an impromptu speech in the kitchen about why were were there, and to coordinate what everyone was doing, so I got to enjoy a mad rush for the morning.There were no accidents, and it was amazing to watch everyone working together. It was such an amazing show of support from the Chefs, all corralled by Chef Miriam Streiman from Mad Maple, who was one of the main organizers, along with me from the Bagida’waad Alliance and Cheryl Jones from the Nawash Food Bank. The Chefs brought their own food and supplies, and solicited donations from food businesses across Ontario for the event. One of our board members, Victoria Serda, was doing social media promotion for us from the Saugeen Ojibway Nation’s Free, Prior & Informed Consent Conference, so people across the world could share in the fun and community spirit of the day! Organic Farms) from Paul DeCampo and Rossana De Angelis of Slow Food Toronto. 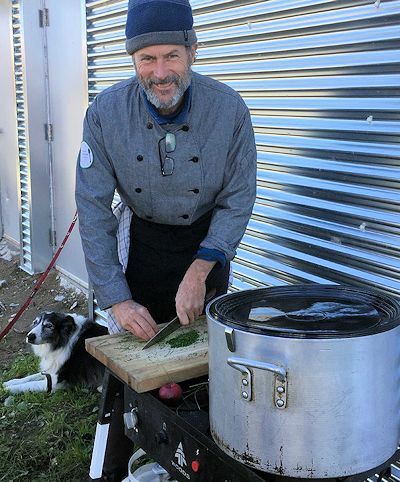 Jamie Kennedy traveled all the way from Prince Edward County away from the Jamie Kennedy Kitchens with his dog to make an amazing Great Lakes Chowder that was well-loved by many. Hearty Chili with Potatoes was lovingly prepared by Luis Valenzuela from Carmen Cocina Espanola. 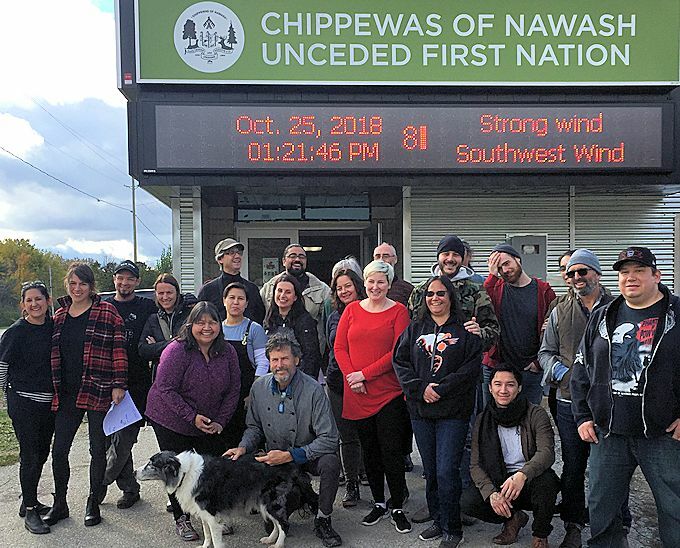 Shawn Adler, of the Pow Wow Cafe in Toronto and Flying Chestnut in Flesherton, was one of the Chefs who had come, and he brought Cindy Phillips with him to come back and help in the community where he grew up by the shore. Andrea Greyerbiehl came, from PomPom and Azzurra, with her hands full of burners, and to assist in the kitchen. Rheanna Kish, from PomPom and the Community Kitchen Cookbook, helped with the buffet’s presentation and service, and the clean up! Kyle Deleary and his helpers Keith Grosbeak and Congson Dang, from Oyster Boy Restaurant, prepared a unique and delicious Pickerel, Roasted Fingerling Potatoes, Caramelized Onions, Smokey Mustard Aioli, along with. Chopped Liver and Onions from Anthony’s new cookbook “The Last Schmaltz”, was made by Anthony Rose and Robert Wilder of Rose and Sons, and Missy Hui made a hearty Winter Salad. 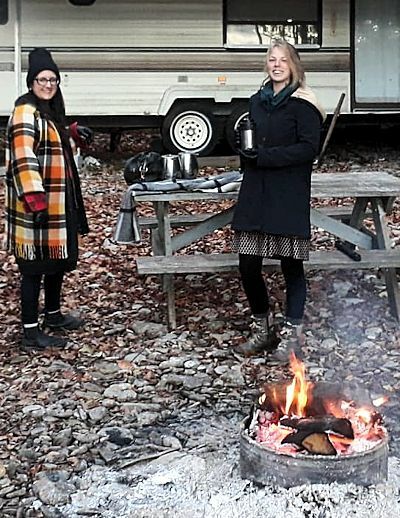 Co-organizer Miriam Streiman created Squash Cakes and Apple Sauce; and Candice Newmaster of Ironwood served her coffee and there was Cedar Tea from our farm. There were generous contributions and support from 100km Foods (squash and apples) and Sanagan’s Meat Locker, with many producer partners and supporters including Ocean Wise, Earth Haven Farm, Wolfe Creek Organic Farms, Warners Farm, Chocosol, and Round Plain Organics. The Collective Menu was written on rocks from Natasha and Andrew’s shoreline, so each Chef’s contribution could be seen by the community when they were served lunch by the Chefs, buffet-style. Before the lunch was opened for service, I spoke briefly to the Chefs to thank them for their generosity and set the stage for the rush of hungry, excited community members! At least 180 people were served, and each dish was amazing and made with love and care. The food donations were beyond generous and very much appreciated. So fresh and full of flavour. I never heard of blue hominy corn, but it was delish. Paul Decampo from Earth Haven Farm even brought up Hopi squash and black beans seeds that will be shared with the community garden next spring. Overall, the energy with the people and Chefs were amazing. People found the Chefs easy to talk to and laughter and smiles were seen in the crowd. Community members were mentioning they would have to search out the restaurants when they visit the city. They were also more quietly whispering that they had seem some of the Chefs on the Food Network, and they were having issues hiding their excitement for meeting them in person! Cheryl Jones, the organizer of the soup kitchen, mentioned how many faces were new that would normally never come out to share in the weekly meal that they host once a week. She said she was impressed how people tried new things, since that has been a challenge for her over the years. The Chefs were able to catch up with each other throughout the day, and a wonderful, high-energy group photo was taken out front of the community centre. From there, some of the Chefs headed out from the community centre, back to their busy kitchens, but some went for a visit to Nawash’s Lighthouse to continue the visit and hear more about what the Bagida-waad Alliance is doing and working toward. Many stories were told about what was happening in the lakes, and what the fishers were seeing in the water. It was an amazing day, full of high and positive energy, friendships renewed and memories made that will be talked about for years to come. This event for me has touched me deeply. Made me feel that we are doing the right thing by giving the waters and fish a voice. I feel like I have enough to push through and that we will be successful as a group. I feel that our friends have us and will be there for us in the future. I feel with everyone’s help, we have put the Bagida’waad Alliance on the map. With their support, we are hoping to give a voice to the Great Lake and its inhabitants, for even the Great Lakes are under pressure from Climate Change. I still smile when I think of Thursday.